Call to make an order! Restaurant located downtown Duluth, MN! Go down Lake Avenue and take a right on West 1st Street. Our restaurant is on the left side of the road. Meter parking spots are available. After 6:00pm it's free! "sweet and sour chicken, chicken fried rice, and beef egg foo young, best ever! mmmm" - Steve L.
"Best place in town. Family favorite for more than 40 years." - Matthew J. "Best fried rice, ham eggfoo young around" - Richard B. "Combo B is the best! The sweet and sour sauce is amazing and unique." - Danielle S.
"Great food. Great price Personal fav. Is oyster wings." 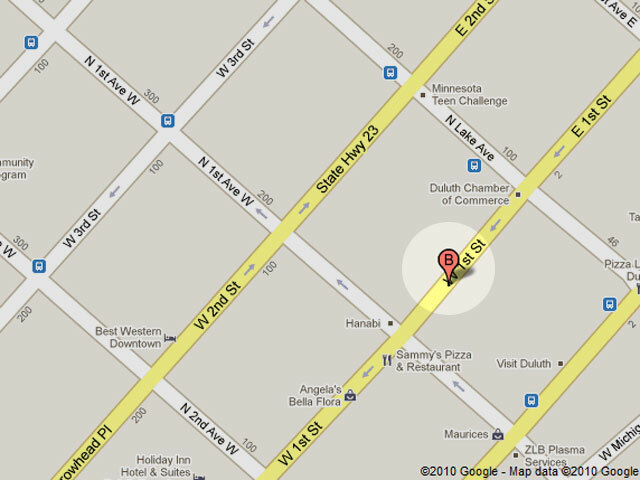 - Trisha L.
"My favorite Chinese food restaurant in Duluth!" - Tedi S.
If you have a Google account, write a review!